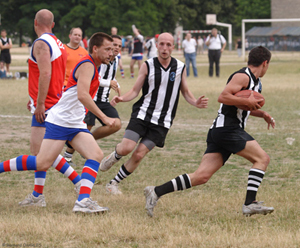 Sunday 28 June 2008 on the playing fields in the Bois de Vincennes in the east of Paris will go down in history as the beginning of a new phase in the establishment of Australian Football in France, the commencement of a new era. 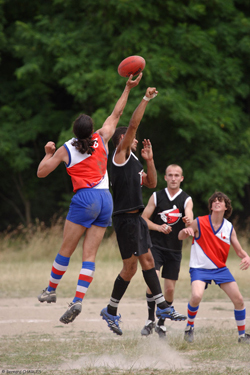 Four teams came from around France to compete in a round robin series concluding in the final. The Montpellier Fire Sharks in the south west is the newest team, having only formed this year. Coming from the Atlantic coast, just above the surfing beaches of south west France, the Bordeaux Bombers are also relatively new, having formed only in 2007. The Strasbourg team, the oldest team playing ‘le Football Australien’ in France, a team which played for a season in the German league, were the third team, and the losing team in the final. One of the Strasbourg players was Marc Jund, the first pioneer of Australian Football in France. Home ground advantage matters in Australian Football around the world as the travelling teams are often missing players who are either busy or find the journey financially pressing. The Paris Cockerels, with the home ground advantage and a few more experienced (that is Aussie) players, ran out winners in the final. The Paris Cockerels won well in the end, defeating Strasbourg 8.9 (57) to 4.4 (28). The day was brilliantly organised by Olivier Tresca and the Paris team including Cyril Tallon. Philip Porublev of Aussie Rules International flew in from Stockholm to be one of the several umpires. Burley Sekem footies, Tim Tams, Fosters and travel advice were available to buy from a stall run by the new AussieNZ shop in Paris. Graham Andrews kept the scores and was ready with the siren all day. A small tent, decorated with Australian and French flags, provided a lunch set for sale, next to the Art Boomerang Club of Paris stand, and a simple and clear guide to footy for those new to the game (‘Le Footy pour les nuls’ – footy for idiots) was hung from the adjacent trees. Despite the hard summer ground, it was both a ‘chaleureux’ or warm and friendly day, with serious footy and a pleasant picnic in the sun for the supporters, and a consolidation of ‘Le football Australien’ in France. Full results available at the Footy Record.